The creation of Lagoon, which was originally the direct extension of JTA (Jeanneau Technologies Avancées), Jeanneau's "competition" department (Pierre Ier, Fleury Michon, etc). Lagoon also answered to unusual requests, such as the construction of the trimarans for the film Waterworld. A first generation of catamarans was born with the Lagoon 55, 47, 57 and 67: owners' boats for offshore cruising. 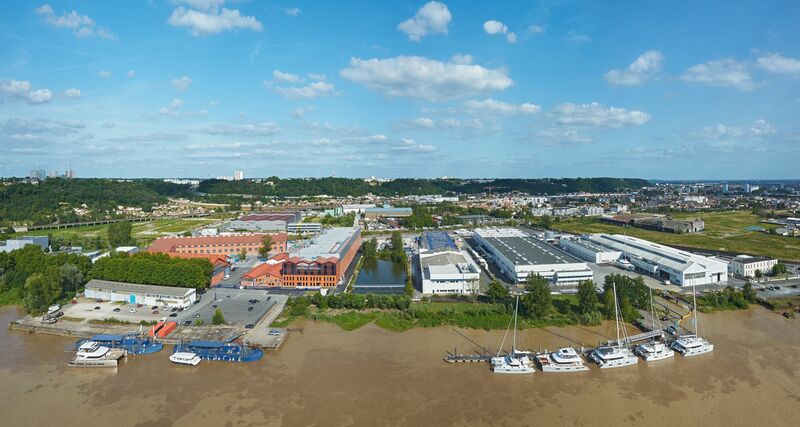 The Beneteau group took over the Jeanneau shipyards in 1996 and handed over the development of the Lagoon brand, a legacy of its acquisition, to Construction Navale Bordeaux. The use of high-tech composite was implemented in the shipyard. Lagoon established its identity, building more and more spacious and comfortable boats, while enhancing construction methods. During that period, the Lagoon models 380, 410, 440, 470, 500, and 570 were launched. The Lagoon 410, the first catamaran of this generation, innovates the market with her vertical glazing. This type of design was to be followed by all large multihull shipyards. Lagoon 380 - Engines in the aft compartment: silent cabins and easy manoeuvring, thanks to propellers situated behind the rudders. Lagoon POWER - The first foray of Lagoon into the world of Motor Boats with the arrival of the Lagoon Power 43 - 113 units produced. A record in the world of multihull motor boats. Lagoon is the world leader in cruising catamaran construction, thanks to an innovative, wide range and its international distribution network (more than 80 specialised distributors with a passion for catamarans). Lagoon 440 - The first catamaran with a "gull wing shape" nacelle, and the first catamaran under 45 feet with a flybridge. An unparalleled worldwide production record in the 45 foot range with 423 units produced. The Lagoon 420 hybrid, the first cruising catamaran in the world equipped with hybrid diesel/electric propulsion. Lagoon launched the Lagoon 620: luxurious, seaworthy and fast, the Lagoon 620 was then the archetype of "large" contemporary Lagoon boats... With than 60 units launched, she was also the world champion in her category. Lagoon 450 marked the first partnership between Lagoon and Nauta Design: a new dimension in design and interior comfort. The new Lagoon 52 marked a major evolution in the design of cruising catamarans. Rigging with the mast step further aft, significantly modified methods of navigation with a self-tacking foresail and more efficient mainsails. Lagoon made a very noticeable comeback in the construction of Motor Yachts with the arrival of the magnificent 630 MY. The shipyard launched the 42, which met with huge success among customers, thanks to this 42 footer's symbiosis between performance and comfort. This new top range approach led to the conception of two over 24m catamarans with large yacht DNA: the SEVENTY 7 and her motor yacht version, the SEVENTY 8.